Letters and calls encouraged low-incomes seniors to enroll in a discount on their water bills. The intervention had a 9 percentage point increase in enrollment (on a base of 1%). Cost of postage and envelopes, plus staff time. 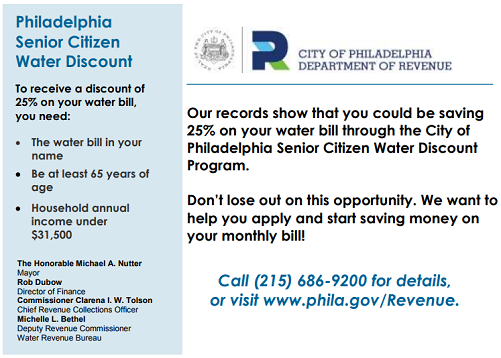 The City of Philadelphia in Pennsylvania offers a discount to low-income senior citizens living in the municipality on their water bills. Senior water and sewer customers can apply to receive 25 percent off their payments for water in an effort to reduce the financial burden on those elderly citizens with lesser means. However, despite the fact that this would benefit the citizens in question, the City of Philadelphia noticed that many low-income seniors eligible for the discount were not actually submitting an application to receive it. It set out to investigate whether more low-income senior citizens could be encouraged to take advantage of the programme. The city tested the effect of using different behavioral nudges, to see how successful these might be in motivating citizens to claim their right to lower water bills. 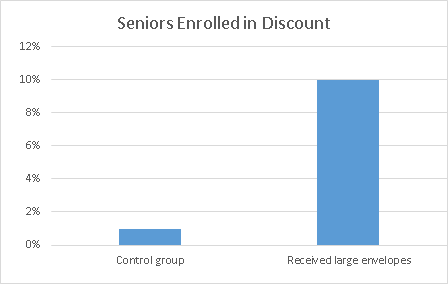 It took a sample of over 6,000 low income senior citizens living in Philadelphia, who were already enrolled in a separate discount program for seniors, and tested the impact of various combinations of messages and sequencing of outreach. The outreach consisted of letters sent in either a large or small envelope, postcards, and phone calls to the homeowners to encourage them to complete their application for the water bill discount. Messaging was based on applying the principles of loss aversion and social norms. The application to receive the discount was also re-designed to make it simpler and easier to complete. Results were measured by the number of information requests from seniors who received the outreach, applications returned, and the number of applications approved for this group, as compared against a control. The City found all of the innovations tested to be successful in achieving the desired aim of motivating more senior citizens to claim their water bill discount. Letters which utilized large envelopes significantly exceeded control in applications returned and approved, with approximately 10% of seniors who were sent a letter in a large envelope receiving approval on their application, as compared to less than 1% receiving approval in the control group. A subsequent trial replaced the large envelope with uniquely colored but standard size envelopes to mimic the benefit from standing out without incurring additional postage costs and allowing the utilization of existing mailing equipment. Evaluation of this second round is underway. Despite the success of the program, the methods were found to be too expensive to scale up for subsequent rounds of testing and on a broader scale for the larger population. The city has extracted the lessons learnt from this experiment to think about cost and implementation on a broader scale before testing on a pilot population when considering further studies. Engage Frontline Staff: Particularly with a Mayoral transition, it became important to include the front line employees in the design and implementation of interventions using behavioral science. These folks were subject matter experts in how the programs worked, what the pain points were, and what might work better. As part of the initial project, we held a meeting to solicit input from staff and had a wrap up session afterward to share the results. Dedicate Time & Resources: Behavioral sciences, human-centered design, and the other approaches that have proved useful require practitioners committed to using them. As a result of this initiative, Revenue created a new position, Administrator of Assistance Programs, and hired someone who is dedicated to increasing enrollment and familiar with these tactics. Provide Start Up Funds: Some of the biggest hurdles in the project, testing which methods were most effective to communicate with low-income seniors, were the most mundane. Securing a few hundred dollars for postage and envelopes outside the normal budget process was essential to figuring out what worked and what didn’t, but was a bureaucratic hassle. For more guidance on implementing this design, select “I want to try this” from the left drop-down menu.